The R-Squared indicator, also known as the Linear Regression R-Squared is a technical oscillator that is displayed on the chart’s sub-window. The R-Squared indicator is used to determine the strength of the more dominant market trend that is prevailing by means of quantifying the strength of the trend. Although there are many technical indicators that allow traders to determine the dominant trend (example, ADX) the R-Squared MT4 indicator takes a more mathematical and a statistical approach to determining the trends. The R-Squared is actually a function, which determines the linear relationship of a value (in this instance price) to time. The closer the linear relationship is over a period of time, the R-Squared translates this into a stronger or dominant trend. The R-Squared indicator oscillates between a value of 0 and 1, plotted in decimals. When the R-Squared shows a reading of 1.00, it signals a strong correlation between price and regression while a score of 0.00 indicates no correlation. The R-Squared indicator should not be used as a stand along indicator but alongside other relative technical indicators such as the Linear Regression Slope indicator in order to confirm the price trends. The most typical values used for the R-Squared indicator is 0.08 and 0.13, which means that higher the value, the more confidence that the dominant trend is likely to continue. The R-Squared indicator can be applied to the charts easily. The settings are also not very complicated. The input values come with a default setting of 9, but any value can be used here. In the example below we make use of a 30 period R-Squared value applied on the daily chart. 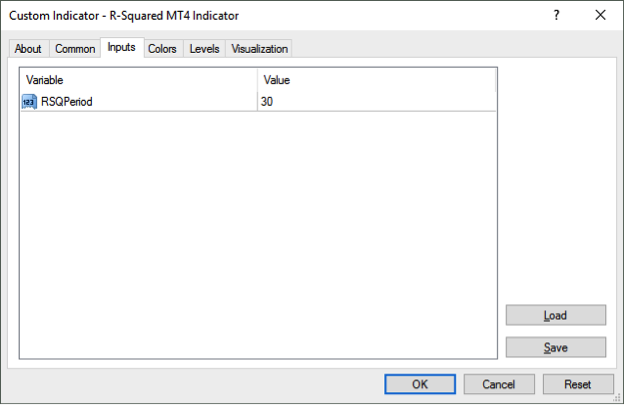 Once the settings are applied to the indicator, you should have the below looking chart with the R-Squared MT4 Indicator. The R-Squared indicator should not be used in isolation but alongside other technical indicators as a confirmation signal of the trend. In the next chart below we can see that when a linear regression slope channel is plotted, the high confidence or a reading of 0.80 or higher coincides with prices trading close to the linear regression line. As previously mentioned, the R-Squared values can offer confirmation of trends. In the next chart, we make use of a 30 period moving average and look at how trends are behaving. The vertical lines mark high level of confidence in the dominant trend. By the time the R-Squared indicator moves back above the 0.80 value, we have already ascertained that the dominant trend is the downtrend. Using other technical indicators such as Stochastics or MACD to time the entry into the downtrend offers a higher confidence in the trades reaching their intended targets. However, this is not always the case. The next chart below shows a trend failure despite the R-Squared indicator pointing out that the uptrend was the dominant trend. This highlights the fact that traders need to build their own additional confirmation signals as noted previously in this article. The R-Squared indicator is therefore to be used as a confirming indicator and works best when it is tied into your existing trading strategy. The R-Squared is known to be predictive in nature as it makes use of the least fit method and is not a lagging indicator compared to most other technical indicator. However, the indicator is prone to false signals as illustrated above.